Much as YBIG is hard to read and engage with if you want serious debate, they really do seem to be leading the growing sense of dissatisfaction with JD. I have long resisted the knee jerk common reaction to blame the FAI for everything. I've met FAI people many of whom are very good. I also said here two years ago that I didn't have much issue with JD getting drunk in Poland. But it seems he gets drunk everywhere and just can't help attracting attention at a time when the national football team is seen as a media sh1tshow. He gets well paid to exercise judgment but instead singing political songs and courting publicity like some VIP socialite is embarrassing, reflects badly on our game and all of us, the loyal supporters. Whether Delaney is fit for purpose or not, is an issue. His removal, one way or the other, deserved or not, will not make the slightest positive difference to the state of football in Ireland. Surely his singing would be missed? Freeing up €300k a year may make a significant change in grassroots level. Root and branch reform of the organisation prompted by a new CEO could make a huge difference. They'll agree with that, produce an expensive independent report on how to change things and then carry on with the dictatorship. The only way that amount will be made available is if the the new CEO works for free! I often wondered if Delaney's salary was a strange sort of job security? i.e. if he is sacked or steps down from his position in the morning, would any viable candidate be interested in doing the same job for significantly less money? All fair comments, and the reality was that if this had happened 5 years ago then we would have used this site. I post on both(others do as well) and the reality is that in order to collect the information to show the size of error for the Scotland game, it was more practical to use YBIG. The information we were able to collect was invaluable and drove the debate. The actions of the FAI after the meeting just added fuel to the fire. I'd be happy if we could get buy in from lots of groups and perhaps people here want to raise queries on behalf of foot.ie users. The video is an embarrassed to the FAI. 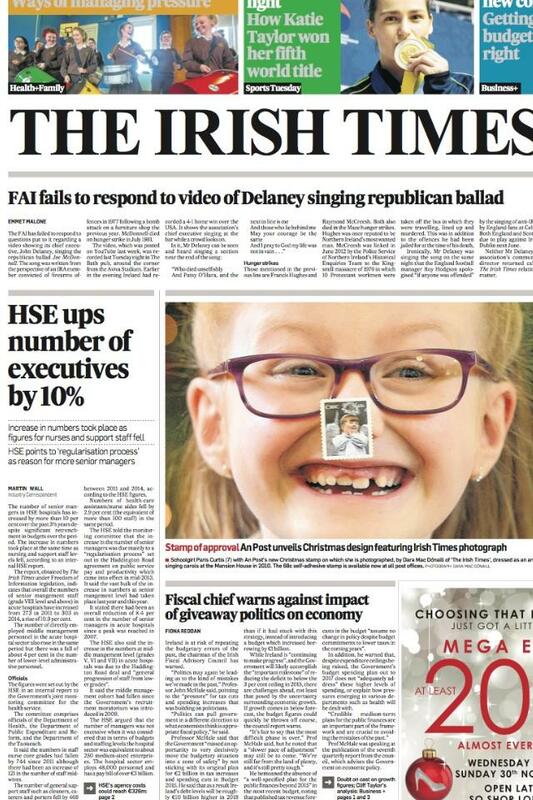 They should sack Delaney and replace him with Bono. It should be a well paid job, just not an extremely well paid job. Sports administration typically isn't a very well paid career, with only the CEO of a decent sports organisation capable of earning what a mid-ranking 35 year old lawyer or banker might earn for example. I saw a sports recruitment (pan-European) salary survey over here a few years ago and JD would have been off the charts. My guess is that your man Regan at the SFA is on about GBP 125k a year. I think a salary of about EUR 200k p.a. would be a good salary for the CEO position that would attract an experienced sports administrator from the UK, Australia (where sports governance is taken very seriously) or elsewhere in the anglosphere. If JD was to go the FAI CEO role should not go to a FAI insider in my opinion although I suspect Sarah O'Shea is next in line. Rumour has it she does most of the nitty gritty anyway. I think JD has brown-nosed UEFA well -up to a point* - and winning the Euro games in 2020 was a feather in his cap. The initiatives to bring football to deprived areas and improve relations with the Gardai etc are brilliant. Credit where it's due. But no matter how hard working he says he is, his salary grates at many people's sense of decency especially when the perception is that the institution is an inefficient collective of stale vested interests resistant to progress. Footy is the working man's game and that kind of money is well out of the reach of his constituents. Blazer culture dominates the organisation as evidenced by the extension of the retirement age to 75. Parts of the game are in crisis. Rightly or wrongly football is overshadowed by other sports. Meanwhile JD swans about town like a Celtic Tiger era property developer socialite, planting PR pieces about his personal life (good luck to him on that front, everyone deserves the right to be happy) and allowing himself to be filmed regularly singing while drunk. It's not so much himself he is letting down, it's us, the guys who have to put up with all kinds of criticism and patronising guff for loving our game and our teams. * if I was in his shoes and as well connected within UEFA as he is I'd be lobbying hard for a policy unit to be established in UEFA to explore ways of empowering the lesser footballing nations. Irish Times reports JD singing republican ballad in pub last week. maybe he's just trying to get extra publicity for the England game, to sell tickets? The depressing banality of a trivial pursuits pc purge. Perhaps he was also having a drink in said pub. Did he wash his hands after using the toilet? it is not just his inflated salary though. Do we know what his annual expense account is? Does he have a pension entitlement? I dread to think. The letters / words CRC, pensions and sense of entitlement come to mind. This buffoon needs removing from his role. Not for singing a republican song but for his consistent demonstration of his inability to lead our footballing body. If he wants a z-list celebratory lifestyle, then let him have it as the former FAI CEO. On pat kenny you show now with his partner.